Ever wondered in which country you would find the tallest rollercoaster in the world? Or wanted to know the terrifying size of the biggest shark known to man? Ever wondered which astronaut has spent the most time in space in total? This is the book for you. 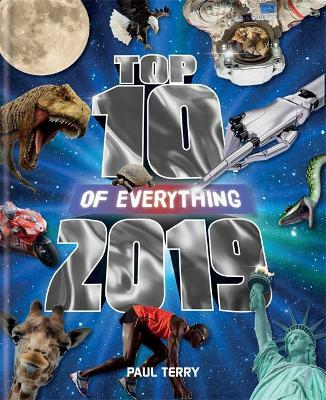 Top 10 of Everything 2019 is divided into genres including Animal Kingdom, Sport, Forces of Nature, Video Games and Mechanical Creations, and includes lists, charts and tables to break down the details of each amazing fact. Packed full of photographs, charts, graphs and incredible information, this is the perfect book for anyone with a curious mind and an insatiable appetite for facts, stats and trivia. Paul Terry is a non-fiction author who has worked with leading kids' brands including LEGO , Disney, The Simpsons, Futurama, and Star Wars. He co-authored the official LOST Encyclopedia and Fringe: September's Notebook for Bad Robot.